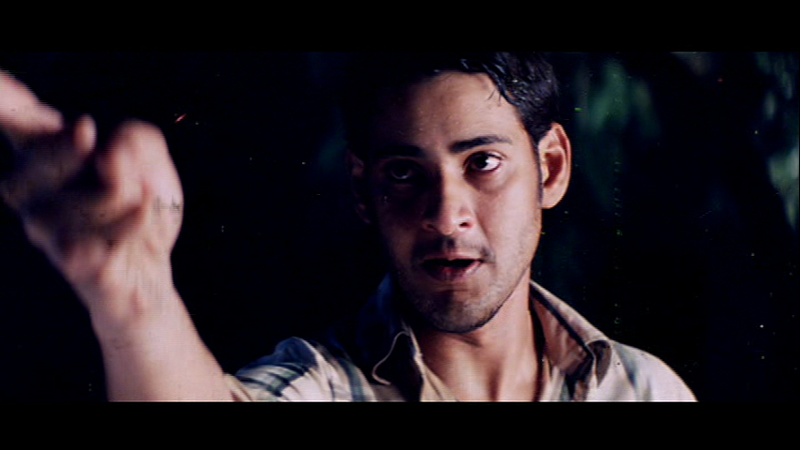 Arjun opens with a bleeding and intense Mahesh Babu staring down the camera. We see a bloody blade, and a gang of rowdies running towards him as he waits in a downpour of rain. It’s a gripping start. Which then gives way to a happy inspirational song and a flashback. After he kills those rowdies of course. A flashback narrative structure can often diminish the drama as the viewer knows the end point. In this case, Gunasekhar uses the form to heighten the tension. While things had obviously gone wrong, the details emerge gradually. We know Mahesh is waiting to deal with his enemies, but it takes time to discover who they are and what has happened. Often in a big star vehicle, the supporting characters are mere sketches. But Gunasekhar has populated the film with memorable people played by excellent actors. As in the previous Mahesh/Gunasekhar project, Okkadu, there is a strong web of relationships that makes it much more engaging. Arjun (Mahesh) is a protective twin determined to look after his sister Meenakhi (Keerthi Reddy). He isn’t one of those sociopath heroes who exist in isolation. There is a pleasantly lived in look to the family home, his office worker parents wear slightly dowdy clothes, and their story is firmly middle class. It’s refreshing to have a hero with a family and to see a sister be more important than a prospective girlfriend. But they are not angels. Dolce – this is for you! As always, a film hero who kills bad guys is not doing anything really wrong so we needn’t be troubled by morality. But there does seem to be recognition that there are always consequences. Certainly there is a different rule for the baddies, and especially if they kill good people. 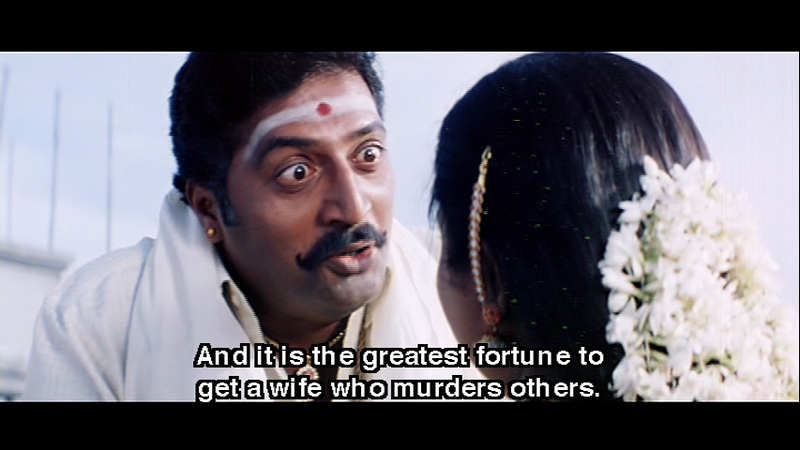 Prakash Raj is Bala Nayagar, a Madurai based bigwig. His wife, played by the still striking Saritha, is his perfect life partner Andal. She knows what he likes to eat, his moods, and when to kill people who annoy him. When their son Uday (Raja) wants to marry college sweetheart Meenakshi they are furious as his engagement to a rich girl had been fixed. The couple are enthusiastic but only moderately successful killers, and many of their schemes to remove Meenakshi fail to comedic effect. Saritha and Prakash Raj seem to have a side bet on who can out-over-act the other and are great fun. But despite the often ludicrous shenanigans, they each have an intensity that makes them genuinely menacing at times. Prakash Raj can turn from jovial to chilling calculation in a blink and Saritha is his match. Mahesh also crosses paths with Rupa (Shriya) – a very annoying girl who invites her own downfall by….blowing a kiss at him. Yes! This cannot be allowed without some form of payback. How dare she! The only way honour can be satisfied is if he stalks her, then harasses her until she marries him. The romances play out very differently. Meenakshi and Uday love each other but neither feels they can upset their parents’ plans. Arjun lays down the law – Meenakshi will not elope and if Uday wants her, he has to tell his parents and all must be done out in the open. This is how he introduces her to the Nayagars. The song gets full points for colour, movement and excellent use of locations. Plus – parrot costumes. There is a theme of blood being thicker than water, and even before things start to take a turn, Arjun is determined not to abandon his sister once she is married. Meenakshi is in peril, often unaware of the danger and even defending her in-laws much to her twin’s dismay. Keerthi Reddy has a nice rapport with Mahesh although her role dwindles once she enters her in-laws home. She has some intense scenes as she shows her pain at her brother’s actions. Although Meenakshi is often passive, it rarely seems that she is passive through a lack of sense. As with some other characters in the film, it is a blend of mass genre cliché and soap opera – this time damsel in distress mixed with modern bride meets traditional family. The parallel of Meenakshi as a divine being and as his sister is not lost on Arjun. The goddess gives comfort and support when his sister turns away, and maybe a small nudge of coincidence. Of course, Rupa lives in Madurai with her domineering dad (Tanikella Bharani). Arjun’s pursuit of Rupa at first seems more about putting her in her place than any romantic attachment, but it is amusing. I am also grateful to the subtitle team who kindly explained the wordplay. Rupa is a really silly character but she does gain appeal over time. She offers to help Arjun when he is at a low point, which makes him see her in a new light (perhaps the light of her doing what makes him happy). Shriya gives a very energetic performance, initially edging onto the Genelia Manic Pixie Dream Girl scale but kind of endearing once she settles. One thing I like about Shriya is that she never seems overawed by her co-stars, and she just goes for it and claims her bit of the screen. She withstands a varied but determined assault by the wardrobe team in the songs. As a couple she and Mahesh have some chemistry but mostly they seem to have fun in their dances. This is my favourite of their duets, choreographed by Lawrence. Mahesh is superb. His anguish over Meenakshi and his playfulness with Rupa are equally believable, and no one emanates fury like he does. Thanks to a thoughtful screenplay, Mahesh has room to act as well as showcase his heroic chops. He uses his lanky frame and the baby faced killer stare to great effect. Some scenes with Meenakshi were really emotional, and he showed the conflict and worry that drove Arjun. It helped give the eventual denouement a much greater urgency and sense of consequence. It also made his super killing powers seem almost believable as it was clear Arjun was desperate to protect his sister at any cost. He did seem to wear more layers of shirts as the film progressed. Was this a visual representation of his attempt to stave off external threats? Or just a change in the weather? But his shirts were not the only item of clothing to make me look twice. The excellent fights directed by Vijayan range from almost lyrical to frenetic. Even his mother gets Arjun to sort out bad guys for her so his skill and bravado have some basis in the story and aren’t just a post-interval acquisition. Arjun has a fairly laconic style, always looks like he knows he will win, and he can fight under water which is very handy indeed. Admittedly, I have doubts about why no one can see him in what seems to be a fairly clear pool, but whatever. The climax of the film is dramatic, suspenseful, over the top and totally improbable but completely compelling. The Madurai set has stunning architecture and decorative flourishes and the crowds provide concealment, camouflage and distraction. The film combines the lush visuals of the temple set with opulent interiors, the intense jewel like colours of silk saris and excellent lighting. The camera work and edits are in keeping with the tone of each scene. The CGI, while a bit dodgy, was used for maximum impact. The soundtrack is OK but I remember the picturisations more than the music so I wouldn’t say Mani Sharma had done anything outstanding. See this for fine actors, great visuals, exciting action and of course a hero you can count on. Mahesh delivers – Arjun is a winner! 4 ½ stars. I did find it a little incredible that Arjun’s mother Kamala was quite happy to set her son up to face a room full of rowdy’s and then walk away and leave him to it. While I appreciate her faith and confidence in her son, I’m more inclined to agree with Meenakshi’s view that it wasn’t a very responsible attitude for a parent to have. It was a quite a novel approach though and as Temple mentioned, did set up the fight scenes for the rest of the film very well. I loved Prakash Raj here as the father intent on marrying his son to his best advantage, but he was totally outdone by Saritha as his wife. She was fantastic in her obsession with the 1001 crore dowry and her expressions as she was either murdering someone or extorting her husband to murder were brilliant. Combined with Kamala, this has to be the film with the blood-thirstiest mothers I have seen and they both added a totally new dimension to the filmi ma character. I loved them! On the negative side though, I couldn’t understand the point of Shriya’s character at all. It doesn’t help that I really don’t like her as an actress, but the plot with Rupa seemed to be stuck on as an after-thought. I don’t think a romance was necessary, particularly since her character had no relationship to anyone else in the plot, and it could have been omitted without any disruption to the rest of the story. My irritation with Rupa in this film was inversely proportional to the amount of clothes she was wearing. In the opening sequence while she was teasing Arjun wearing skimpy clothes she was incredibly annoying and I really hated the first song with her. Later on, when she was more modestly dressed in a sari I was better able to ignore her and her presence wasn’t quite as grating. While the main story of Meenakshi’s marriage and murderous in-laws was engaging and the action thrilling, there was a little too much fluff in the rest of the story for me to become totally engaged with the other characters. 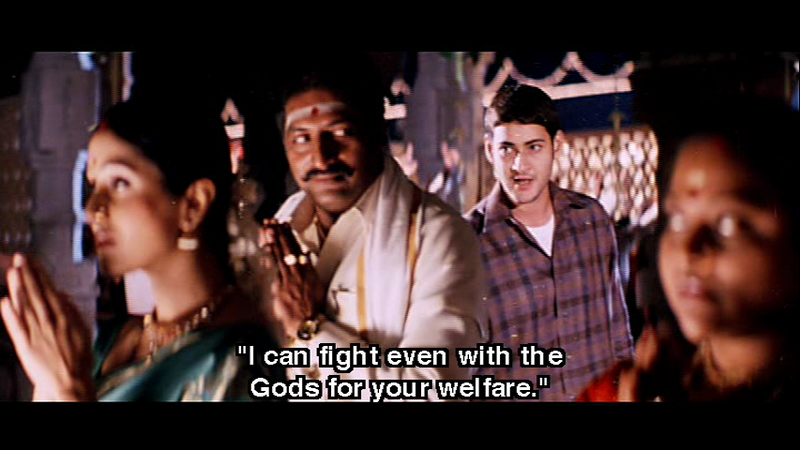 A winner in terms of Mahesh’s performance and worth seeing how Gunasekhar proves Arjun can walk on water. 3 ½ stars. This entry was posted in Tollywood and tagged Arjun, Gunasekhar, Keerthi Reddy, Lawrence, Mahesh, Mahesh Babu, Mani Sharma, Paruchuri Brothers, Prakash Raj, Raja, Saritha, Shriya, Shriya Saran, Tanikella Bharani, Telugu, Tollywood, Vijayan. Bookmark the permalink. Have you people seen Varudu? I love the totally over the top character of Diwakar and I liked the action sequences but the story I have to admit isn’t the greatest. I’ve shown it to quite a few friends who don’t regularly watch Indian films as well though and the response has always been very positive. 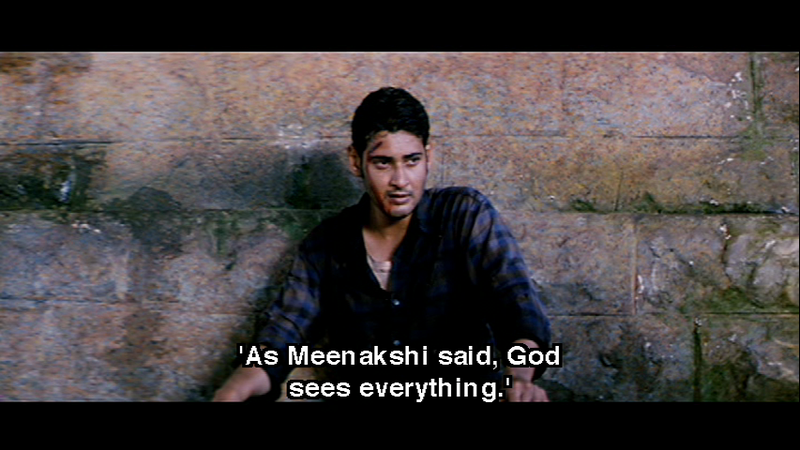 I also liked the other Gunasekhar film I’ve seen – Okkadu and I have Sainikudu in the pile to watch. I just hope the DVD quality on that is better than it was for Arjun! Do you recommend any others he’s done? And if you haven’t seen Choodalani Vundi, you should do it already. Directed by Gunasekhar and stars Chiranjeevi, Soundarya and Prakash Raj!! I really like the story, the setup, and also the wonderful score by Manisharma. And it’s always a delight to watch Soundarya. 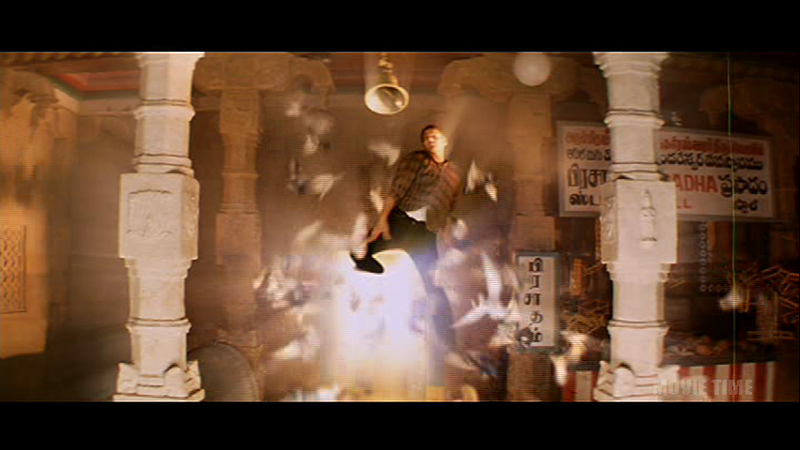 The temple set which is worth 3crores INR is the best part of this movie above everything else.. They built all of that? Wow – it’s a pretty amazing set! Yes.. the complete temple was built… they built the set in the outskirts of Hyderabaad …. I was amazed how well the set resebled the temple when I actually went to Madurai… I think the art director won the national award for this work..